Introduction: Investigation into the psychological effects of violence toward health care workers and its associated trauma is increasing. The Impact of Event Scale (IES) provides a measure of current, subjective, emotional distress symptomatic of a specific traumatic event. However, its validity among paramedics is largely unknown. Problem: The purpose of this study was to investigate the psychometric properties and factor structure of the IES with a sample of Australian paramedics. Methods: The study aimed to investigate the psychometric properties and factor structure of the 15-item IES with a sample of Australian paramedics using Exploratory Factor Analysis with model fit statistics as found in confirmatory analysis. Results: Maximum Likelihood Factor Analysis with Varimax rotation supported the hypothesis that a two-factor solution would provide the best fit of the data. Procrustes rotation provided further support for this hypothesis indicating that the factors, labeled “Intrusion” and “Avoidance”, as well as the individual items of the 12-item final model, were a good fit to an ideal solution. Conclusion: The revision of the scale has improved its validity for use in the general population of paramedics, improving the potential for its use in trauma-related research. Investigation into the psychological effects of violence toward health care workers and its associated trauma is intensifying.1,2 As the terminology used to study workplace violence is varied,2–4 this paper will seek to use a health care research-based definition, referring to occupational-based violence (OBV), which is defined as “hitting with a body part, slapping, kicking, punching, pinching, scratching, biting, pulling hair, hitting with an object, throwing an object, spitting, beating, shooting, stabbing, squeezing, and twisting”.5 Though incidence rates of OBV in health care are not well described,6 paramedics have been reported as being at elevated risk7,8 and thus this investigation will focus on the psychological effects of OBV in this population. The most commonly utilized tools for screening for posttraumatic stress disorder (PTSD) symptoms include the Post-traumatic Diagnostic Scale13 the Mississippi Scale,14 the Penn Inventory,15 the Clinician-administered PTSD Scale,16 the Post-traumatic Stress Symptom Scale,17 and the PTSD Checklist—civilian version.18 However, consistency in PTSD instrument use with workers exposed to OBV has not been established. The fact that the diagnostic criteria for PTSD in the Diagnostic and Statistical Manual (DSM)19 has changed between recent editions20 and that PTSD was not a recognized disorder before 198021 may contribute to an explanation for this inconsistency. Despite the changing diagnostic criteria for PTSD and the creation of new instruments used to measure its effects, the Impact of Event Scale (IES)1 remains in use. For this reason, the IES can be seen as providing a standard source of post-traumatic stress symptom data for almost 35 years. A self-report measure, the IES was developed by Horowitz et al1 and assesses the “typical symptomatic response to exposure to traumatic life events (and) current subjective distress”. The IES was initially administered with a small sample of 66 participants, who were chosen from a pool of participants seeking psychotherapy as a result of reactions to a variety of serious life events. The majority of life events used as the referent for the scale were bereavement related with the remainder including personal injuries resulting from accidents, violence, illness, and surgery. Informed by literature and psychotherapy interviews, Horowitz22,23 posited that the experience of a traumatic event presents an individual with information, which is incompatible with their existing understanding of the world. This incompatibility leads to distress and a consequent need for the revision and assimilation of that understanding. During that period of change, the individual experiences phases of psychological intrusion and avoidance of the traumatic event that fluctuates until the person is said to have dealt with the experience. At this point, they reach a relative baseline. Beyond this period, intrusion and avoidance may become pathological. The scale comprises 15 items including two subscales measuring intrusive thoughts and those of avoidance, which give a total subjective stress score. The items were derived from the most frequent statements made by participants of previous psychotherapy interviews24,25 about episodes of distress that followed traumatic life events. Horowitz adjusted the wording of the statements through further use with psychotherapy patients undergoing stressful events and to allow for their application to any traumatic event. Abbreviations: PCA, principal component analysis; IES, Impact of Event Scale. The reported factor structure of the IES has varied widely. There has been a lack of population specificity within which the IES has been validated and the definitions of the underlying psychological characteristics of the instrument itself have been modified over time. The difficulty in obtaining a large enough sample from any one distinct type of trauma has also been noted in previous validation studies of the IES.37 Consequently, considering the rates of OBV in a paramedical population, factor analysis with such a sample would prove advantageous. The current study aimed to investigate the psychometric properties and factor structure of the IES with a sample of Australian paramedics using Exploratory Factor Analysis (EFA). Evaluation of the factor structure was based on analysis of congruence coefficients after a Procrustes targeted rotation. It was hypothesized that EFA with model fit statistics as found in confirmatory factor analysis would provide support for a two-factor solution corresponding to the two subscales of Avoidance and Intrusion. Participants were paramedics employed by the South Australian Ambulance Service and Rural Ambulance Victoria. 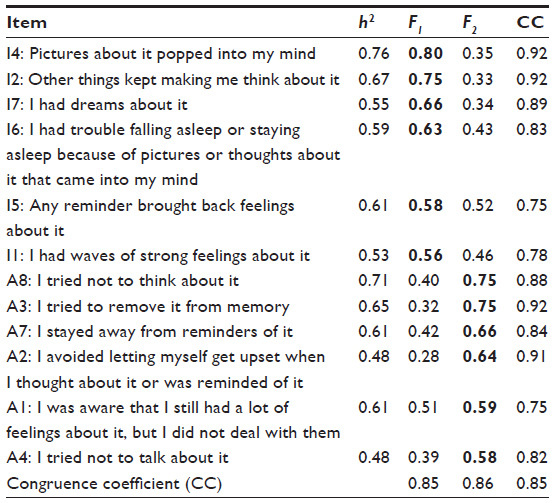 The IES consists of 15 items, 7 of which measure intrusive thoughts and 8 of which measure thoughts of avoidance. Respondents read 15 statements about a single, traumatic life event and indicate, on a four-point Likert scale, how many times during the previous 7 days that they have experienced each: (0) “not at all”, (1) “seldom”, (3) “sometimes”, or (5) “often”. The study was approved by Monash University Human Ethics Committee. The IES was administered as part of a larger, 98-item questionnaire (available on request) given to a sample of paramedics. The sample of paramedics was recruited through the South Australian Ambulance Service and Rural Ambulance Victoria, whose randomly selected paramedic members were mailed questionnaires with a return envelope. Distribution names were blinded to the study team. The nature of the research, assurances of confidentiality, and counseling contacts were given to participants as part of the survey, which was completed anonymously and sent back to a central location. A total of 255 surveys were returned which included 13 students, who were subsequently removed from the analysis. A further 12 participants were removed as they only provided demographic information. No records were made available to indicate the level of response rate. The mean age of participants was 41 years of age, the majority being male n=172, who had worked on average 45.2 hours a week. A full demographic profile of the 230 participants is presented in Table 2. Abbreviations: M, means; SD, standard deviation. The correlation matrix was inspected for factorability and evidence of coefficients >0.3 was found, attesting to the strength of the relationship among variables or among items.35 Kaiser-Meyer-Olkin measure of sampling adequacy (0.9346,47 and Bartlett’s test of sphericity (χ2 =2,284.55, df =105, P <0.001) indicated that the sample was appropriate for factor analysis.48 The sample size of 230 with a 15-item questionnaire produced a ratio of participants to items of 15:1, which was greater than the recommended 10:1,49 and as the number of cases exceeded 150, was considered as “sufficient”.48 A review of Catell’s scree plot50 and of Parallel Analysis51 supported only one factor; however, Tabachnick and Fidell48 suggest to explore one factor more and one factor less than suggested by the scree test and Parallel Analysis. Also, the IES was theoretically designed to measure two factors. Given these conditions, further analysis was conducted retaining two factors. In total, the two-factor solution accounted for 56.39% of the total variance in scores and the rotated factor matrix is presented in Table 3. Communality values tended to be relatively high with the exception of the item originally written for the Avoidance subscale “I felt as if it hadn’t happened or wasn’t real”, labeled A6. As this item had the lowest communality of 0.29, it correlated very weakly with other items and loaded weakly and primarily on the Intrusion factor. It was consequently excluded from the next factor analysis. Two subsequent factor analyses conducted before determining the final solution removed items A5 and I3 on varied bases of low communality; counterintuitive primary and cross-loading and incongruous and ambiguous wording. Abbreviation: IES, Impact of Event Scale. The final model that provided the best overall fit is described in Table 4. After the removal of item I3 from the analysis, the solution accounted for 60.37% of the total variance in scores. Factorability of the correlation matrix was again supported with a Kaiser-Meyer-Olkin value of 0.93 and a significant Bartlett’s52 test of sphericity. Though, once again, Catell’s50 scree test indicated one factor. Notes: Factor loadings >0.40 are in boldface. h2, Communalities; F1, Intrusion; F2, Avoidance. Procrustes transformation indicated global solution congruence with an ideal target matrix of 0.85, suggesting a good fit.43 The factors within the global solution also displayed good congruence42,43 with an ideal matrix (Intrusion 0.85 and Avoidance 0.86) as did most items (range 0.75–0.92). The results are presented in Table 4. Reliability analysis indicated adequate internal consistency with a Cronbach’s alpha coefficient of 0.92. The subscales demonstrated acceptable reliability,53 with Cronbach’s alpha of 0.89 and 0.90 for the subscales of Avoidance and Intrusion, respectively. Inter-item correlation ranged from 0.45 to 0.69 in the Avoidance subscale, from 0.49 to 0.74 in the Intrusion subscale and from 0.31 to 0.74 in the overall scale, providing further support for the reliability of the scale. See Table 5 for subscale alpha, means, standard deviations, Kurtosis and Skewness coefficient data. Abbreviations: M, mean; SD, standard deviations; S, Skewness; K, Kurtosis. The purpose of the study was to investigate the psychometric properties of the IES in a sample of Australian paramedics. The hypothesis that the best-fitting solution for structure and dimensionality was a two-factor solution was supported. The factor structure of the IES was investigated using Maximum Likelihood Factor Analysis with Varimax rotation, followed by an evaluation of model fit using Procrustes rotation. The overall factor structure corresponded to that originally proposed by Horowitz et al,1 who interpreted the separation of the two factors as indicating the existence of the two phases of psychological intrusion and avoidance which occur after the experience of a traumatic event. Many subsequent validity studies also supported a two-factor structure;29,30,33,37,54–58 however, a 12-item model provided a better fit to the data than the original 15-item model. The items “I felt as if it hadn’t happened or wasn’t real” (labeled A6); “My feelings about it were kind of numb” (labeled A5) and “I thought about it when I didn’t mean to” (labeled I3) were removed from the final model. Factor loadings were high (see Table 4). The final model and subscales also demonstrated internal reliability better than that first published by Horowitz et al. Not only do the IES items retained in previous studies vary, but the two-factor structure, which is reported in the current study, is also contentious. While the scree plot test and the eigenvalues of the current study suggest the extraction of a single factor, the moderate to strong correlations that have been reported between the factors in the previous studies1,33,54,58–66 have been used by Solomon et al65 in their study of the IES with combat veterans also suggest that the overall scale could comprise one factor. The tendency toward lower discriminant validity between the factors may also be indicative of sampling bias – the greater the proportion of the sample who is not reporting experiencing trauma symptoms, the higher the correlation between the factors. Furthermore, although Andrews et al67 reported the IES as being multidimensional in their confirmatory factor analysis, they argued that a multidimensional factor structure could be time dependent. Specifically, Andrews et al postulated that “the longer the time elapsed since the trauma, the more symptoms (of subscales) differentiate”.67 However, the researchers provided little supporting evidence for such an assertion other than the aforementioned observation of the moderate to high correlations in previous studies. Instead, Williams et al66 argue the reverse. That is, immediately following trauma, intrusion and avoidance may be dissociated but increasingly become associated over time. Evidence in support of this increasing factor association can be found by analyzing the conditions under which the scale is administered as well as symptom severity. Specifically, the type of traumatic event that has been experienced, the time period between the experiencing of the traumatic event and the completion of the scale and even a total lack of traumatic experience are argued to affect factor structure. Although the robust validation of the IES includes its administration across these varying conditions, it is important to remember that the IES was originally designed to be administered within 7 days to participants who had experienced a traumatic event. Consequently, such administration conditions need to be distinguished to account for any potential confounding effects. The study has a number of limitations. The effect of low-level scoring is important in the current study as responses of participants who had not experienced traumatic events were included. That is, it is predicted that these particular participants recorded very low responses, which would have affected the correlation of the subscales in the same manner that a delayed administration might. However, another limitation of the current study was that these participants were not distinguished according to traumatic event exposure in the scale’s administration and thus testing for the effect of their inclusion was not possible. The inclusion of all participants also provides an explanation for the positive skew in the item responses. Considering the potential for such population differences in our study and that the definition of the traumatic event used was so broad, future research involving factor structure investigation would benefit from the investigation of the effects of specific types and rates of violence on traumatic symptomatology. More investigation into the IES with these groups would need to be conducted to see whether the structural differences occur as a result of the inherent differences in the events experienced or as a result of variability between the occupational groupings themselves. This research found that when an appropriate confirmatory approach is used, with the exception of three items, the original two-factor structure of the IES in the Australian paramedical sample is evident. The finding that the two-factor solution was statistically superior to the one-factor solution suggests to researchers and practitioners that the primary responses to trauma are reflected by this two-factor structure. Although the complete instrument might previously have been found to provide an explanation for traumatic symptomatology, the revised instrument is more robust as it includes a large proportion of participants who may not have experienced a traumatic event. The current results provide workplace trauma researchers with evidence that the IES is a potentially useful, valid, and psychometrically robust instrument for the screening of traumatic effects of OBV in Australian paramedics. We would like to thank the Australian paramedics for taking the time to complete the questionnaire. Horowitz MJ, Wilner N, Alvarez W. Impact of event scale: a measure of subjective stress. Psychosom Med. 1979;41(3):209–218. Hills D, Joyce C. A review of research on the prevalence, antecedents, consequences and prevention of workplace aggression in clinical medical practice. Aggress Violent Behav. 2013;18(5):554–569. Barling J, Dupré KE, Kelloway EK. Predicting workplace aggression and violence. Annu Rev Psychol. 2009;60(1):671–692. Rippon TJ. Aggression and violence in health care professions. J Adv Nurs. 2000;31(2):452–460. Gates DM, Ross CS, McQueen L. Violence against emergency department workers. J Emerg Med. 2006;31(3):331–337. Pompeii L, Dement J, Schoenfisch A, et al. Perpetrator, worker and workplace characteristics associated with patient and visitor perpetrated violence (Type II) on hospital workers: a review of the literature and existing occupational injury data. J Saf Res. 2013;44:57–64. Hahn S, Zeller A, Needham I, Kok G, Dassen T, Halfens RJG. Patient and visitor violence in general hospitals: a systematic review of the literature. Aggress Violent Behav. 2008;13(6):431–441. Mayhew C, Chappell D. Workplace violence in the health sector – a case study in Australia. J Occup Health Saf. 2003;19(6):5–45. Corbett SW, Grange JT, Thomas TL. Exposure of prehospital care providers to violence. Prehosp Emerg Care. 1998;2(2):127–131. Suserud BO, Blomquist M, Johansson I. Experiences of threats and violence in the Swedish ambulance service. Accid Emerg Nurs. 2002;10:127–135. 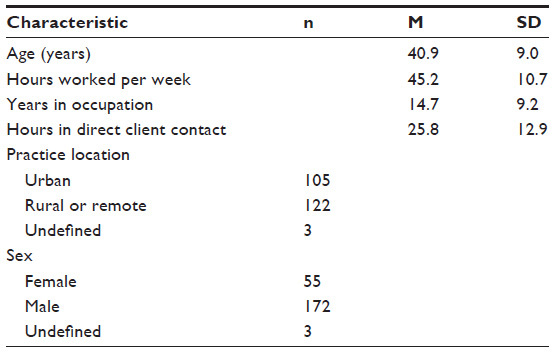 Pozzi C. Exposure of prehospital providers to violence and abuse. J Emerg Nurs. 1998;24(4):320–323. Boyle M, Koritsas S, Coles J, Stanley J. A pilot study of workplace violence towards paramedics. Emerg Med J. 2007;24(11):760–763. Foa EB, Cashman L, Jaycox L, Perry K. The validation of a self-report measure of posttraumatic stress disorder: the posttraumatic diagnostic scale. Psychol Assess. 1997;9(4):445–451. Keane TM, Caddell JM, Taylor KL. Mississippi scale for combat-related posttraumatic stress disorder: three studies in reliability and validity. J Consult Clin Psychol. 1988;56(1):85–90. Hammarberg M. Penn inventory for posttraumatic stress disorder: psychometric properties. Psychol Assess. 1992;4(1):67–76. Blake DD, Weathers FW, Nagy LM, et al. The development of a clinician-administered PTSD scale. J Trauma Stress. 1995;8(1):75–90. Foa EB, Riggs DS, Dancu CV, Rothbaum BO. Reliability and validity of a brief instrument for assessing post-traumatic stress disorder. J Trauma Stress. 1993;6(4):459–473. Weathers FW, Litz BT, Herman D, Huska J, Keane T. The PTSD Checklist – Civilian Version (PCL-C). Boston, MA: National Center for PTSD; 1994. Gnanavel S, Robert RS. Diagnostic and statistical manual of mental disorders, fifth edition and the impact of events scale-revised. Chest. 2013;144(6):1974. Weiss D, Marmar C. The impact of event scale-revised. In: Wilson JP, Keane TM, editors. Assessing Psychological Trauma and PTSD: A Practitioner’s Handbook. New York, NY: Guilford Press; 2004:399–411. Horowitz MJ. Intrusive and repetitive thoughts after stress. Arch Gen Psychiatry. 1975;32:1457–1463. Horowitz MJ. Stress Response Syndromes. New York: Jason Aronson; 1976. Horowitz MJ. Phase oriented treatment of stress response syndromes. Am J Psychother. 1973;27:506–515. Horowitz MJ. Stress response syndromes: character style and brief psychotherapy. Arch Gen Psychiatry. 1974;31:768–781. Sundin EC, Horowitz MJ. Horowitz’s impact of event scale evaluation of 20 years of use. Psychosom Med. 2003;65(5):870–876. American Psychiatric Association. Diagnostic and Statistical Manual of Mental Disorders. 4th ed., text rev. Washington, DC: American Psychiatric Association; 2000. Hogh A, Hansen AM, Mikkelsen EG, Persson R. Exposure to negative acts at work, psychological stress reactions and physiological stress response. J Psychosom Res. 2012;73(1):47–52. Pietrantonio F, Gennaro LD, Di Paolo MC, Solano L. The impact of event scale: validation of an Italian version. J Psychosom Res. 2003; 55(4):389–393. Thatcher DL, Krikorian R. Exploratory factor analysis of two measures of posttraumatic stress disorder (PTSD) symptoms in a non-clinical sample of college students. J Anxiety Disord. 2005;19(8):904–914. Krisztina K-B, Monika M, Dora PF. Hungarian version of the Impact of Event Scale. Psychometric evaluation. Psychiatr Hung. 2012; 27(4):245–254. John PB, Russell PSS. Validation of a measure to assess post-traumatic stress disorder: a Sinhalese version of Impact of Event Scale. Clin Pract Epidemiol Ment Health. 2007;3:4. Zilberg NJ, Weiss DS, Horowitz MJ. Impact of Event Scale: a cross-validation study and some empirical evidence supporting a conceptual model of stress response syndromes. J Consult Clin Psychol. 1982;50:407–414. Larsson G. Dimensional analysis of the Impact of Event Scale using structural equation modeling. J Trauma Stress. 2000;13(2):193–204. Comrey AL, Lee HB. A First Course in Factor Analysis. 2nd ed. Hillsdale, NJ, England: Lawrence Erlbaum Associates, Inc.; 1992:xii:430. Pallant J. SPSS Survival Manual: A Step by Step Guide to Data Analysis using SPSS. New York, NY: McGraw-Hill International; 2013. Joseph S, Williams R, Yule W, Walker A. Factor analysis of the Impact of Events Scale with survivors of two disasters at sea. Pers Individ Dif. 1992;13(6):693–697. Thewes B, Meiser B, Hickie IB. Psychometric properties of the Impact of Event Scale amongst women at increased risk for hereditary breast cancer. Psycho-Oncology. 2001;10(6):459–468. Zakowski SG, Valdimarsdottir HB, Bovbjerg DH, et al. 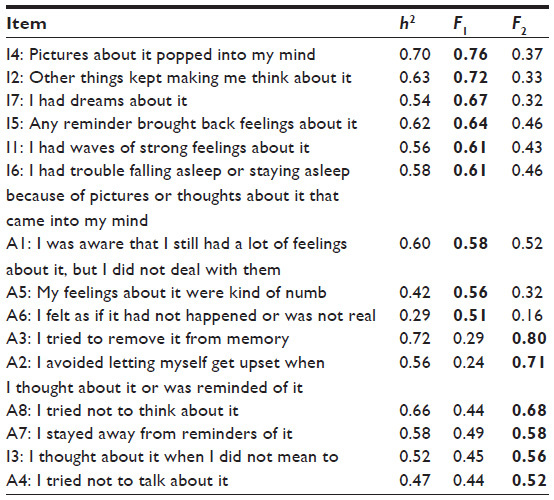 Predictors of intrusive thoughts and avoidance in women with family histories of breast cancer. Ann Behav Med. 1997;19(4):362–369. McCrae RR, Zonderman AB, Costa PT Jr, Bond MH, Paunonen SV. Evaluating replicability of factors in the Revised NEO Personality Inventory: confirmatory factor analysis versus Procrustes rotation. J Pers Soc Psychol. 1996;70(3):552–566. Barrett P. Orthosim. Auckland: NZ; 2006. Lorenzo-Seva U, ten Berge JMF. Tucker’s congruence coefficient as a meaningful index of factor similarity. Methodology. 2006;2(2):57–64. Barrett P. Factor comparison: an examination of three methods. Pers Individ Dif. 1986;7(3):327–340. Little RJA, Rubin DB. Statistical analysis with missing data. New York: John Wiley and Sons; 1987. Enders CK. A primer on maximum likelihood algorithms available for use with missing data. Struct Equ Modeling. 2001;8:128–141. Kaiser HF. A second generation little jiffy. Psychometrika. 1970;35(4):401–415. Kaiser HF. An index of factorial simplicity. Psychometrika. 1974;39(1):31–36. Tabachnick BG, Fidell LS. Using Multivariate Statistics. 6th ed. Harlow, Essex: Pearson Education; 2014:682–683. Nunnally JC. Psychometric Theory. New York, NY: McGraw-Hill; 1978:180. Catell R. The scree test for number of factors. Multivariate Behav Res. 1966;1:245–276. Horn JL. A rationale and test for the number of factors in factor analysis. Psychometrika. 1965;30(2):179–185. Bartlett M. A note on the multiplying factors for various chi square approximations. J R Stat Soc. 1954;16(Series B):296–298. DeVellis RF. Scale Development: Theory and Applications. 3rd ed. Thousand Oaks, CA: Sage; 2012:44–45. Schwarzwald J, Solomon Z, Weisenberg M, Mikulincer M. Validation of the impact of event scale for psychological sequelae of combat. J Consult Clin Psychol. 1987;2(55):251–256. Joseph S, Yule W, Williams R, Hodgkinson P. The Herald of Free Enterprise disaster: measuring post-traumatic symptoms 30 months on. Br J Clin Psychol. 1993;32(Pt 3):327–331. Yule W, Ten Bruggencate S, Joseph S. Principal component analysis of the Impact of Event Scale in children who survived a shipping disaster. Pers Individ Dif. 1994;16:685–691. Hodgkinson P, Joseph S. Factor analysis of the Impact of Events Scale with female bank staff following an armed raid. Pers Individ Dif. 1995;19:773–775. Robbins I, Hunt N. Validation of the IES as a measure of the long-term impact of war trauma. Br J Health Psychol. 1996;1(Part 1):87–89. Bryant RA, Harvey AG. Initial posttraumatic stress responses following motor vehicle accidents. J Trauma Stress. 1996;9(2):223–234. Creamer M, Burgess P, Pattison P. Cognitive processing in post-trauma reactions: some preliminary findings. Psychol Med. 1992;20:597–604. Hovens JE, van der Ploeg HM, Klaarenbeek MTA, Bramsen I, Schreuder JN, Vladar Rivero V. The assessment of posttraumatic stress disorder: with the Clinician Administered PTSD Scale: Dutch results. J Clin Psychol. 1994;50:325–340. Kopel H, Friedman M. Posttraumatic symptoms in South African police exposed to violence. J Trauma Stress. 1997;10:307–317. Neal LA, Busuttil W, Rollins J, Herepath R, Strike P, Turnbull G. Convergent validity of measures of post-traumatic stress disorder in a mixed military and civilian population. J Trauma Stress. 1994;7:447–455. McFarlane A. Avoidance and intrusion in posttraumatic stress disorder. J Nerv Ment Dis. 1992;180:439–445. Solomon Z, Mikulincer M, Arad R. Monitoring and blunting: implications for combat-related post-traumatic stress disorder. J Trauma Stress. 1991;4:209–221. Williams R, Joseph S, Yule W. The role of avoidance in coping with disasters: a study of survivors of the capsize of the Herald of Free Enterprise. Clin Psychol Psychother. 1994;1:87–94. Andrews L, Shevlin M, Troop N, Joseph S. Multidimensionality of intrusion and avoidance: alternative factor models of the Impact of Event Scale. Pers Individ Dif. 2004;36(2):431–446.